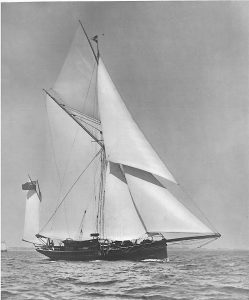 Lethe, Yawl, 163 tons. Lieut.-Colonel Watson-Kennedy. Designed by Mr. G. L. Watson in 1889. Was born in 1856. Joined the Black Watch in 1874. He served in Egypt in 1882-1884, the Soudan 1884 – 1885, the Nile Expedition 1898, and South Africa. Was elected a member of the Royal Yacht Squadron in 1899. He is owner of the fine 163-ton yawl Lethe, which was designed by Mr. G. L. Watson and built by Fay in 1889. She is one of the finest cruising yachts from Mr. Watson’s board, and has won very many prizes, being particularly powerful and weatherly in hard breezes. Residence: Wiveton Hall, Cley, Norfolk.